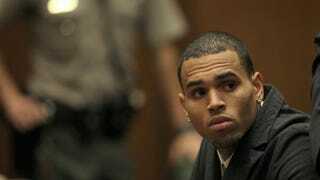 Looks as if Chris Brown will have to wait to learn his fate regarding the alleged beating of a Maryland man. His trial, which was set to begin in Washington, D.C., Wednesday, has been put on hold for months and could be delayed as long as a year, the Associated Press reports. Brown's bodyguard, Christopher Hollosy, was tried separately and found guilty of assault on Monday. He was supposed to be the key witness in Brown's case and, according to AP, was expected to say that he, not Brown, was the sole puncher in the altercation. according to AP, prosecutors declined to do that after he refused to meet with them to discuss his testimony—and also because they believe his likely testimony, that he alone threw a punch, would be a lie. His lawyer said that if immunity wasn't granted, Hollosy wouldn't be able to give his account of what happened until after he appealed his conviction, which could take six months to a year. No new trial date for Brown was set. Prosecutors say that both Brown and Hollosy hit Parker Adams, 20, after he jumped into a photo Brown was taking with two women outside his tour bus in Washington, D.C. During Hollosy's trial, witnesses testified that Adams and Brown argued over the "photobombing" and Brown, then Hollosy, hit Adams, AP reports. After the incident, Hollosy told police that he hit Adams after Adams tried to get on Brown's tour bus, and Brown made a similar statement. "I think all of this is much ado about nothing, and frankly I look forward to being able to try this at some point," Brown's lawyer, Mark Geragos, told AP outside the D.C. court Wednesday. Read more at the Associated Press.